Great products, competitive rates, solid results AND a grow-to-give company. By helping people plan, protect and invest wisely, we can all live more generously. Reinvesting a portion of our corporate earnings for member benefits and the causes members care about is how we pay it forward. Action is the key. What we do is who we are. 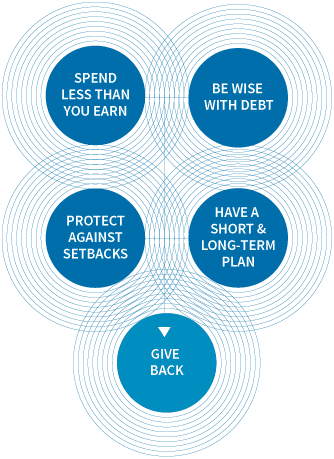 It’s widely understood that wise planning helps people achieve their financial goals. But it’s not just the planning, it’s the doing that makes a difference. Here’s how we help our members to be wise with money and live generously. We offer insurance and investment solutions to protect your financial future. We guide you with financial principles to help you be wise with money. We believe life changes when you view money as a tool, not just a goal. *Learn more about our history here. At some point we all worry about money. But for every stage of life, being wise with money starts with a plan. Our approach connects faith and finances to help you plan protect and invest wisely to serve God, your family and your community. We’re here to help you understand your options and plan ahead to make wise choices. Developing money habits that are based on sound financial principles will help you feel more confident about your finances. Studies show that people who follow sound financial principles are more likely to have a healthy relationship with money. Regardless of your life stage, these principles are part of our ongoing conversations about being wise with money. Our decisions are influenced by the values we hold. At FaithLife Financial, we believe that being wise with money and living generously go hand in hand as an expression of our faith. Member benefits, like Action Teams, Mission Trips, and Chapter participation, provide opportunities for members to impact the lives of others in Canada and around the world. It all comes down to this – our difference is the difference we’re making together with our members. given by FaithLife Financial and our members to support individuals and communities all over the world since 1972. 80,000+ volunteer hours invested through hundreds of member fundraising events every year. *Calculated as of December 2017. Including the value of member volunteer hours, based on the calculation rate recommended by the Canadian Centre for Philanthropy. Calculated as an average between 2013 and 2017. Protecting financial futures. Living Christian values. Building a better world. Vibrant communities of people living by Christian values – inspired to grow in stewardship, compassion and generosity.